We had a nice crowd of attendees on Sunday afternoon for the lecture on Herman Maril given by Provincetown Art Association and Museum (PAAM) Director Christine McCarthy and the release of the new Herman Maril book at University of Maryland University College (UMUC). But the best part of the event, in my opinion, was the audience Q & A and feedback after Chris McCarthy initially spoke. I’m always interested in hearing comments from former colleagues and students, but it was my brother’s remarks that got me thinking. A question was asked of myself and my brother as to our experiences growing up in the household of a famous artist. My brother, David, talked about being ashamed of the old cars that we drove and the way my father dressed. As the younger child, and a girl who favored bohemian attire, I liked my dad’s clothes even though he dressed differently from businessmen. Yes, my dad looked quite different from other people’s dads, but I thought he looked quite handsome and so did most of my female classmates. Regardless of whether people knew he was a famous artist, when my father walked into a room, smiled, and made eye contact, people were attracted to his warmth and his charm. My father loved his heavy khaki pants, and woven plaid shirts. On the days he commuted to College Park to teach at the University, he would wear a light blue button down shirt with a tweed jacket and a woolen textured tie, usually with stripes. I bought him several of those ties, as they were within my budget. I remembered they cost $3.50. One day my mother and I were shopping at the old Hutzler’s Department store in Towson and there was a weaver from Scotland set up with her loom. We were able to select the colors of the tie we wanted woven to purchase. What a special gift I had to give that Christmas! As someone who has owned many “older” unfashionable cars as an adult, I can write as a parent that all children tend to be ashamed of old cars. There were many times that my kids specifically asked us NOT to pick them up in a certain car. I don’t think I still have a picture of it, but for about 10 plus years I drove a very large 1988 brown Caprice Chevy wagon. We called it the potato wagon and it very much reminded me of some of the station wagons my parents owned. Because they often transported paintings, the cars my parents purchased had to have wide bodies to accommodate large canvasses. In my case I had a large car for transporting antiques. 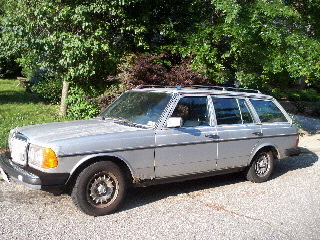 Nicer was the vintage Mercedes wagon we used to own. I do have a photo of that car, and the children used to think it was cool. Unfortunately it just got too tired and worn out to keep.